We keep concert tickets because that show meant something to us. But what about tickets from shows that you never went to. What would you do if you were giving the chance to redeem your ticket for a show that was supposed to happen over thirty years ago? Would you keep the unused ticket because of the sentimental value or would you take the offer in hopes of finally getting to have the concert experience you always wanted to have but couldn’t? Well, The Who fans now have that chance. Yep, that’s right. 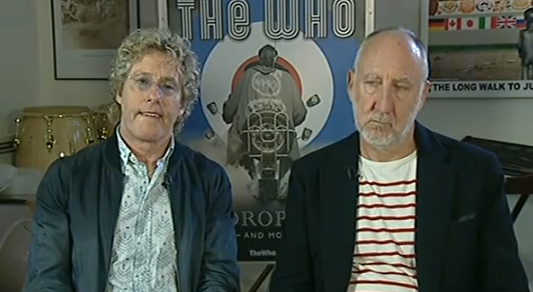 Fans who have a ticket from The Who’s canceled 1979 show in Providence are now being offered the chance to redeem their ticket and see the band in Providence during the Who’s forthcoming Quadrafina tour in 2013. One of rock history’s bleakest moments was in 1979 when fans attending a general-admission Who concert at Cincinnati’s Riverfront Coliseum rushed the stage in hopes of getting the best seats. Instead, they found tragedy in the form of 11 people killed and several injured. Because of the calamity, Providence Mayor Buddy Cianci ordered the band’s scheduled appearance in his city canceled. The Who has never played Providence since. But that will change Feb. 26 when The Who roll into Providence to play the same venue it was scheduled to appear at in ’79, now called the Dunkin Donuts Center. What’s more, venue GM Lawrence Lepore is offering to honor the original 1979 tickets at the 2013 show. But before you pull that old ticket out of your scrap book, you’ll need to know that it will be treated as a ticket, a 1979 ticket, meaning you’re not going to have anything left of the memento other than the stub, if that. Yes, it is cool that the Who is doing this. It’s actually a pretty entertaining PR move too. A whole bunch of thoughts started rolling around in my head when I read this story. For starters, I was thinking that the fans who do redeem their ticket would be paying for a performance by a very different band. Clearly the band isn’t the same as it was in 1979. But ya now what? Sometimes it doesn’t matter. Sometimes changes in the band don’t matter to fans. Sometime it works out in the band’s favor and fans don’t even notice the switch or care that the original lineup isn’t what they’re paying for. For example, when The Who toured in 1979 the band had undergone a major change. If you take a quick look at this Who wiki, you’ll see that the 1979 tour didn’t include Keith Moon because he had died in 1978 and was replaced by Kenney Jones who played on their 1979 tour. Which means that the cancelled 1979 show in Providence wouldn’t have included the full original band anyways. So again, it seems that fans didn’t care and they went to the shows in droves even without Moon behind the drums. If that’s the case, then there must have been something else that drove fans to the show. What Does That Ticket Represent? Thinking about that redeemable ticket and what it represented to fans, I couldn’t help but wonder what those 1979 shows must have been like for fans who were witnessing the raw energy and creative output of Townshend, Entwistle and Daultry as they collectively struggled through the emotional fallout and grief. Moon was a central part of the Who’s live show and it must have been awkward and immensely difficult for them to play on without him. What did they feel as they tried to cope with the pain of not having Moon on stage with them? How did that pain influence the music? Did the band play better because of the surge of sad and angry emotions? How did that struggle influence the emotional reaction of the fans? I’ve been to some highly emotional shows like this Weezer show where you could feel the palbable energy in the venue but the band doesn’t say a thing and only lets the music do the talking. Then there are other concerts I’ve been to where grief is the central catalyst and the emotions are part of the dialogue between the bands and the fans, during and between songs. Just like this Sugarland show after the tragic stage collapse. However it becomes part of the show, and whether or not it was what drove The Who fans to buy tickets to the 1979 tour, these emotional backstories and subplots always take the show to a deeper level. These moments always make the concert more engaging and memorable because you get to see a side of the artist that you haven’t seen or felt before. And in cases like GWAR fans, the band carries on not for the band’s sake but to support the fan’s emotional and mental health. That said, it must have been extremely cathartic for The Who to play those shows and equally cathartic for the fans who probably shared many of the same thoughts and feelings about losing Moon. So whether it’s The Who fans, GWAR fans or even Michael Jackson fans, what happens in these live music moments is that you have thousands of other fans around you going through the same experience. In my studies and experiement I’ve discovered that concerts are a complex mix of joy, grief and community. Just like this. But rarely do we stop to think of live music in this way. But we should. Because even if we don’t have any specific clinical or scientific proof (yet) that this stuff is happening to us and to those around us, I believe that what drove fans to the 1979 tour was not only the hunger to rock out. Underneath it all was the fan’s the desire to express themselves through the shared grieving experience of between fans and the band during the tour. What Will Happen During the 2013 Tour? So whether it’s joy, pleasure or pain, I wonder what will fans experience and feel during shows on this 2013 tour? Will the shows be a place of mouring and glorious rush of rocking memory re-call? Will younger fans (and kids that rock) who don’t know The Who backstory go to the shows to see the remaining legends and be inspired to carry the torch for a new generation? Will knowing that Pete Townshed and Roger Daultry are the only remaning members take away from the emotional value of redeeming that 1979 ticket? Will fans go to the show and just let their emotional memories take over and see the show as a moment to reflect and reminisce on their own life and not even care about missing band members? All this said, if I was a fan who had a 1979 ticket to see the band, I’m still not so sure I would go to the 2013 show, because to be honest the emotional significance of the 1979 canceled show has more meaning that seeing half the band in 2013. Don’t get me wrong, I would go to the show to experience Townshed and Daultry live but I wouldn’t say I saw the Who live because for me it just isn’t the same. Do you have a ticket from the 1979 show? Did you see the band during their 1979 tour? Do you plan on going to the tour in 2013? If you do plan on redemening the ticket or know anyone who does have a ticket, drop us a comment and we’ll share your story on a future episode of Live Fix Radio.